Say “Columbia River Gorge” to a native and a few things might come to mind: the three-day music and, uh, plant festival also known as Dave Matthews Concert weekend at the Gorge Amphitheatre or the engineering wonders of our myriad hydroelectric dams, perhaps. Or maybe the ridiculously breath-taking views that made it the first recognized National Scenic Area. Much like Ben Franklin supposed that “beer is proof that God loves us, and wants us to be happy,” the 80 mile stretch between Portland and The Dalles seems proof positive that God loves the Pacific Northwest just a little bit more than other places. Between the waterfalls, the perfect windsurfing conditions and the dramatic canyon walls only a badass Ice Age flood could produce, the Columbia River Gorge is a bona fide treasure. So the fact that it’s also home to over 35 stellar wineries, well…it’s hardly fair, right? The Gorge wineries run the gamut from torchbearers like 2009 Washington Winery of the Year Maryhill, to boutique wineries like Piedmonte-inspired Marchesi Vineyards of Hood River and the slightly-scandalously-named (and unsurprisingly popular with the young folks) Naked Winery. The Gorge AVA is relatively new, but packs a wallop into 40 miles of real estate, with a wide range of terroir that has earned it the tagline “a world of wine in 40 miles.” The impressive geological realities that make the Gorge gorgeous and windsurfer-friendly (varied elevation, varied rainfall and some serious wind gusts) also allow a wide variety of grapes to be grown throughout the Gorge. While they can’t bring you the windsurfing, the Columbia Gorge Winegrowers are bringing Seattleites the nectar of the Bridge of the Gods on May 6th at Wine World Warehouse. 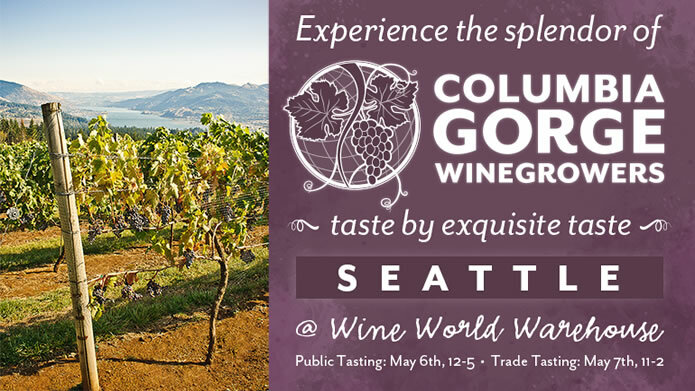 From noon-5:00pm, Columbia Gorge Wineries will be pouring a variety of wines that showcase the depth and breadth of varietals coming out of the region, with winemakers on hand to serve as your virtual terroir tour guide. Solstice Woodfire Café will be serving up hors d’oeuvres to pair. Tickets are on sale now, and just $25. Get inspired for your next weekend road trip and preview the best the Gorge has to offer.